Wow, it’s been a busy few days, but we’ve gotten in all of the experiments and observations we set out to do. As I mentioned in my last post, it could not have been done without some spectacular collaborators – both the students and faculty from UMET as well as the staff of Las Cabezas de San Juan. So what did we do? Well, this program is intended as a pilot educational program, in which students from UMET develop and carry-out research projects with oversight by faculty mentors. It’s funded by NSF as an REU (research experience for undergraduates) and we’re involved to assist with the research and provide perspective from a research institute. We at UMCES are also here to build up collaborations with folks here, and I think we can declare victory on all fronts. So what about the science? Well, we are mostly measuring rate processes in two lagoons, Laguna Grande (LG), which is a famous bioluminescent lagoon, and Laguna Aguas Prietas (LAP) which is not bioluminescent but of similar size and very close to LG. The major research question we are addressing is why are some lagoons bioluminescent and other are not? Anecdotal evidence suggests that some lagoons are bioluminescent some of the time, but others are more consistent, and the consistent ones are an important tourist ressource for the island of Puerto Rico. Thus, understanding how these systems could be an important step toward managing this amazing natural resource. To do this, we are measuring primary production by the algae, grazing by the dominant copepods, and grazing by the microzooplankton. We are doing all these measurements using various incubation techniques that are well described in the literature and have a long pedigree, though none have been done in bioluminescent bays, to our knowledge. In addition one of our colleagues is looking at the flux of nutrients between the sediments and the water, again using tried and true techniques in a new place. At the end, once the students have processed all the samples and crunched all the numbers, we hope to put this together into a numerical model of the lagoon, so we can then test what could happen if conditions change. We started with a conceptual model that the students developed today, so that we have a framework with which to begin building the numerical model. Please note that these are drafts, created in Illustrator with the UMCES IAN symbol library. I’ll write more, but it’s dinner time and we’ve earned it. Plus we’re leaving tomorrow, so only one more day to enjoy the mofongo! We are finishing up our first day of sampling here at Las Cabezas de San Juan, and I’m too tired to write much but I thought I’d give a few quick impressions. Our seven students, two volunteers, and two faculty are some of the best collaborators I’ve worked with, as are my UMCES colleagues. The lagoon is an exciting system, quite different from anything that I’ve worked in before, and the reserve is an excellent place to work. Our accommodations are extremely comfortable and incredibly picturesque. It’s times like these that remind me why I got into this business. But I digress, because I’m going to help the students clean up from their zooplankton grazing experiments in a moment, so I’ll leave you with some pictures of our work and our environment. More to come dear reader. And I’d like to note that all these pictures denote work, despite the fact that they look like they came from a vacation album! In less than 24 hours I’ll be on my way with two other colleagues to Puerto Rico, where we will be working with a group of faculty from the Universidad Metropolitana to help them develop a program to train and expose undergraduates to scientific research. Specifically we will be helping with some field observations and experiments in two different lagoons in the NE corner of the island. One of these lagoons is called Laguna Grande, and is part of a nature reserve called Las Cabezas de San Juan, and most interestingly it has one of a small number of “bioluminescent bays” that make up an important tourist resource in Puerto Rico. We will be working with the students and faculty there to study the ecology of this system and compare it to a neighboring lagoon that does not have consistent bioluminescent. I will try to update this space with more information about the bioluminescence and our experience, but now it’s off to pack for the trip. We’ll be conducting experiments to look at the productivity of the system as well as the feeding of large zooplankton on the bioluminescent algae that give the bay its characteristic bioluminescence. 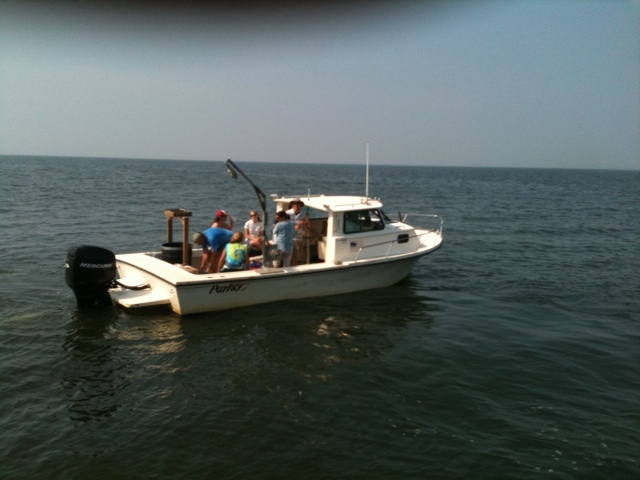 In addition, there will be nutrient measurements and some genetic analysis of the bay. So stay tuned! We’re back out on the R/V Sharp for the last of 6 cruises on the DeZoZoo project. By this time, those of us who have been out here before feel like we’re sailing with old friends. And it’s great to have a few new folks out here too! This time out, we started the cruise with a long scanfish survey, one that started further north than we usually go. 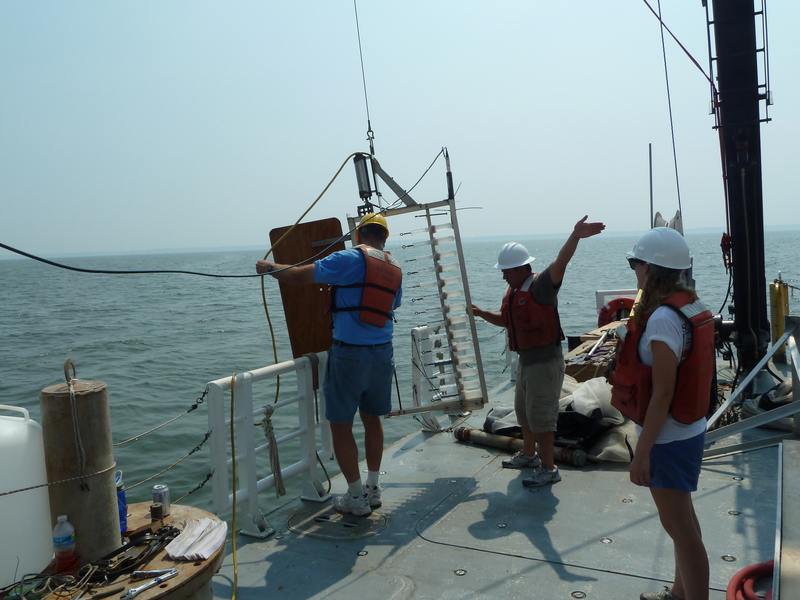 We did this so we could find the fresh water signal of Topical Storms Irene and Lee in Chesapeake Bay. Because the Bay’s watershed is so big, including portions of Maryland, Virginia, Delaware, Pennsylvania and New York, these storms brought A LOT of rainwater down into the Bay. This time out, we’re getting rained on some. But we can’t complain too much since we’ve had such excellent weather on all of our previous cruises. We’re at our South station now, trawling for zooplankton, fish and jellyfish using a variety of nets (MOCESS, Tucker Trawl and Midwater Trawl). Our crew is out on deck now, working hard in a steady rain. “Props” to the night watch! The Sharp’s crew is great – as always! Thanks to the cook for a delicious fish dinner tonight! We’ll try to upload another post soon. The ship’s wireless internet is not working right now. Maybe we’ll have better up at the North station. Our last cruise for the DeZoZoo project is coming up quickly, but I won’t be able to make it. I’ll actually be at an ICES conference in Gdansk, Poland during the cruise but our intrepid team is going to be out there collecting samples and data. I’m disappointed to miss it because it should be an interesting cruise. Hurrican Irene and Tropical Storm Lee dumped massive amounts of rain into the Chesapeake Bay Watershed and mixed up the water. When I say “mixed” I mean literally mixed it; the high winds drew water up from the bottom and send surface water down deep. There are some indications that the hypoxia went away shortly after the hurricanes, but it may have reestablished by now, so we will find out. There are some great images from the NASA satellites that are available on the web, including from the MD DNR Eyes on the Bay website. Today we had a nice visit from our friends that are working on the LiDZ project, as well as a few other visitors. It was a pleasant diversion from our standard operating procedure but it also meant we had to exchange two of our science team for two others. The reason is simply because the ship is at capacity, as is our lab. We have two teachers and two undergrads working on science and education projects through the COSEE Coast Trends program. More on that later, but suffice it to say that we’ve got lots of able bodies and not enough beds, so we had to do a transfer. Our LiDZ colleagues brought the new folks out and took the departing scientists back, but while they were out there they took some samples and raided the ice cream fridge. We’ll miss our departing folks, but have some strong, fresh team members coming off the bench! Syringe sampler and the team that uses it! What samples did the LiDZ folks take? Why, I’m so glad you asked! They brought out a “syringe sampler” that can take multiple small water samples simultaneously over a 1.5 m range. It works by installing a series of syringes on an aluminum frame. The plungers are closed when they are installed, and a piece of line is tied from the plunger to a rotating bar. When the gizmo reaches the required depth, a motor is activated that winds the strings up on the bar, pulling the syringe plungers, which pulls water in. It’s a very useful tool to have if you are looking for chemical and biological gradients in the water, which is something we are keenly aware of for this project. It would not sample my beloved copepods very well – they would just swim away – but it likely samples copepod food pretty well. What I’m talking about are the small single-celled organims that either photsynthesize (= phytoplankton or algae) or eat other single-celled organisms ( = microzooplankton). 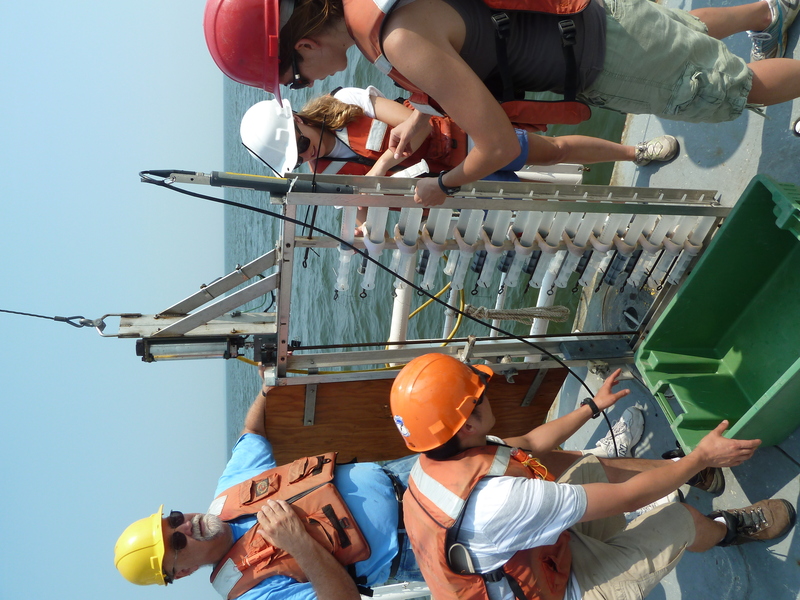 The water can also be sampled for chemical compounds, and this group is the team to do that. 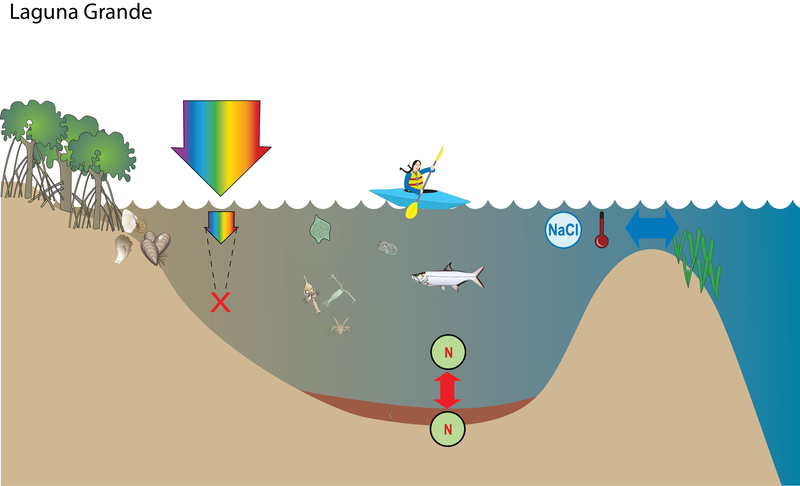 They are looking for gradients in nutrients like nitrate, nitrite, ammonia, and phosphorous, but also other chemicals such as dissolved oxygen and metals such as iron and manganese. Samples were also taken to examine the bacterial communities that exist across these small gradients, to see how different or similar they are. The syringe sampler being deployed. To figure out how to make this thing most useful for our science goals, we first huddled around the CTD screen to see what the water properties looked like. Then, the group figured out what depth would have the strongest and most interesting gradient to sample. 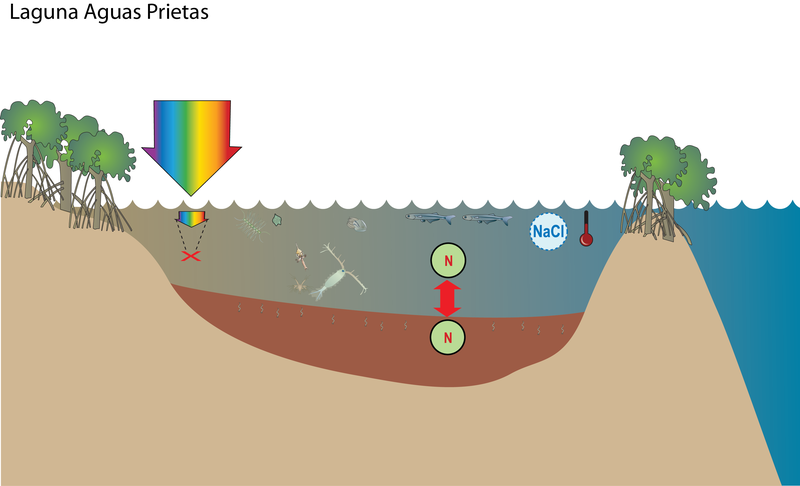 What they were looking for was a region of the water where things change fast – where oxygen decreases quickly over very small changes in depth, for example. Then, they picked a spot that would include the lowest, anoxic water in their deepest syringe samples but would have oxygenated water in the highest samples, and sent it over. Once it got to the desired depth – determined by a counter on the winch that reports how much wire is out, as well as a sensor at the top of the instrument that give readings of temperature, salinity, oxygen, fluorescence, and depth – the motor is started, which opens the syringes. Then it’s brought back and samples are taken. We won’t know for a while what they found, but we can be sure that it was worth their trip. Stay tuned for updates from the hot and sticky ship as we work to unravel the mysteries of the Chespeake Bay zooplankton. Hello all, just to introduce myself, my name is Jessica Snyder and I’m an undergrad at ECU and this is my first time on a research boat. The most exciting news I want to report first of all before I go on to say anything else is, with help from the crew, We collected sea nettles today! This is one of the reasons I was sent all the way from ECU in Greenville, NC! And there was much doubt if there would be sea nettles in the Bay due to the unusually low salinity in the water. But so far the sea nettle collection count is a whopping 8. There is still heaps amount of time left to fulfill our need of only 14 for me to take back to ECU. Hopefully the next time I catch some I will be a little bit smarter and wear 2 gloves to prevent from getting jelly fish sting on my face from touching the jelly then touching myself. Lesson learned on that experience, however the sting only lasted a couple of minutes and was gone. So, if anyone was wondering, it did not call for urine on the face to relieve the sting (if that myth is even true). My first working day was a success. Waking up at 5:30 AM was not as bad as I imagined due to the resting day on Tuesday where I got to Catch up on some reading and get some R and R from the long travels I had to endure all day Monday. We then had frequent breaks throughout the 12 hour day which allowed us to cool off from the sweltering sun. Among the things I got to experience today are z tows and z traps where we collected copepods and jelly nets where we collected ctenophores. We also collected ctenophore larvae that we counted under a microscope. So, today has been a success, learned a lot of great things and got to work with some awesome people. 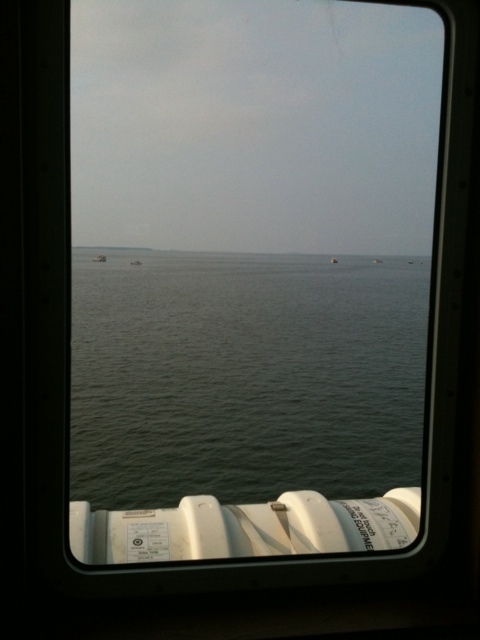 Now onto some things about the oh, so exciting, boat life. First, I would like to begin with props to our Ecuadorian Chef, Paul, who makes some amazing food! So far we’ve enjoyed gyros, pork chops, and amazing chicken that falls right off the bone. We definitely will not be going hungry on this boat. There’s what seems to be a never ending supply of ice cream, a candy drawer, and sweets scattered all around the dining room. If we ever happened to be stranded on a deserted island (I don’t think there’s any around the CB Bay, so no worries) then I think we could all survive happily for a couple of weeks. Some advice I wish I could have given myself prior to packing was to add more t- shirts since you sweat through your shirt a couple hours into your shift, more socks (stupidly I only packed 2 to last me the whole week, apologies to my roommates), and more suntan lotion to steer clear from the odd tan lines we are all inevitably going to have anyways. This week is going to be interesting, insightful, and a great learning experience! I really appreciate the opportunity to be a part of this and I’m really excited for the upcoming days! !